On Wednesday, the real-life Book Club Babes met to discuss our latest selection: The Storied Life of A.J. Fikry by Gabrielle Zevin. None of us had heard of this novel or its author before, but with over 96,000 ratings and 15,000 reviews on Goodreads, it was clear that this book had some major buzz. The protagonist A.J. 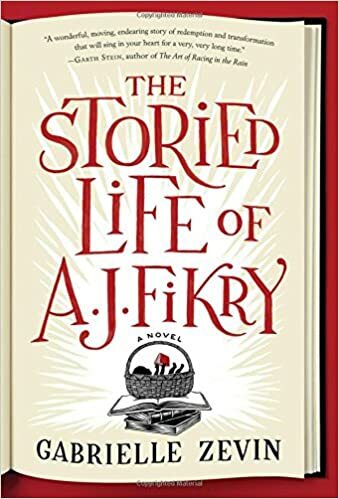 Fikry begins the story as a curmudgeonly middle-aged man, grieving the loss of his wife and dealing with the challenges of running his failing bookstore on a small island off the east coast. He doesn’t particularly like Amelia, the sales rep from Knightley Press, or the annoying tourists, or anyone for that matter. Then a two-year-old named Maya is abandoned on his store’s doorstep, and A.J. must learn how to embrace life once again. This book felt like a coming-of-middle-age novel, because over the course of a decade, the reader sees how A.J.’s character evolves to become more empathetic and optimistic. I’m not that fond of stories about parenthood, given my lack of desire in parenting myself, but it’s heartwarming to watch how Maya changes A.J.’s life for the better. My book club agreed that this book was cute and charming, and we were all pleasantly surprised to learn that it featured characters of color. According to the author, “A.J. and Maya are both mixed-raced, as am I! A.J. is half-Indian and half-Caucasian, and Maya is half-African American and half-Caucasian.” This book demonstrated that characters can be diverse without race relations dominating the conversation, because skin color doesn’t make a family. If you’re looking for a book that makes you smile and enjoy the love of reading even more, then check out The Storied Life of A.J. Fikry. It’s short and sweet, clocking in at only seven hours on audio, which is perfect for readers with busy schedules. As the Book Club Babes declared, this novel may not be an unforgettable masterpiece, but it puts you in a good mood, and that’s what stories are supposed to do. This entry was posted in Audiobook Review and tagged audiobook, book review, Gabrielle Zevin, The Storied Life of A.J. Fikry by Book Club Babe. Bookmark the permalink. I definitely agree with your book club! This was a charming read, especially for people who love books!